Years ago, I picked up all four of the KISS solo albums within the span of two or three months, but the Ace album was my first purchase, based on it getting the most positive reviews. I prefer Paul’s release over this one, but Ace’s offering for the 1978 solo stunt is very good and rocks the hardest out of all four. Paul’s album was the most KISS-like, Gene’s was typically all over the place musically (and had more cameos than a rap album) in an attempt to find a hit somewhere, Peter gave us a lounge act, but Ace? Ace just wanted to rock. Ace scored the biggest only commercial hit of all for albums with “New York Groove”, but the standout track is the beautiful instrumental “Fractured Mirror”. In fact, “Fractured Mirror” is so good, that Ace has given us three sequel instrumentals over the years: “Fractured II” (from 1987’s Frehley’s Comet), “Fractured III” (from 1989’s Trouble Walkin’) and “Fractured Quantum” (from 2009’s upcoming Anomaly). 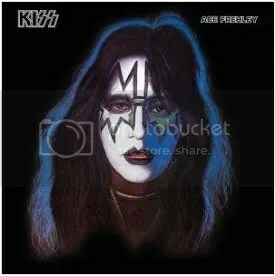 While I think Ace usually has the weakest song on KISS albums, this album is proof positive that he can write great rock songs and perhaps Gene & Paul should’ve allowed/encouraged him to do a bit more while a member of KISS. The Ace solo album is considered to be the best of the four and I definitely agree. When I got this in the mid-80s on cassette, I played it to death. The thing is that when Ace wants to, he can create some great songs, and this was the right album for him to make at the right time. It was KISS-like but not. Peter’s was R&B/Soul, Gene’s was way too experimental and gimmicky, and Paul’s was completely KISS…..you could have released Paul’s solo record as the follow-up to Love Gun and all would be well in the KISS universe. I think the Ace album is considered the best because Ace was always perceived as the lazy oone. Yeah, that is a bad cover. Have you heard the single “Outer Space“?